At the age of fifteen, Akari Mizunashi traveled from Man-Home (what was once known as Earth), to the beautiful city of Neo-Venezia on the planet Aqua (a terraformed Mars) to become an apprentice undine, or gondolier, with Aria company under Alicia Florence, one of the three renowned undines known as the "Water Fairies". 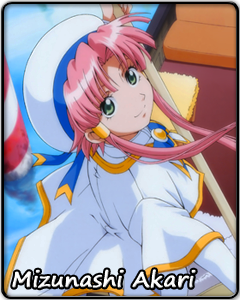 Akari gives off an aura of innocence and easily makes friends with her affectionate and welcoming attitude. She has several unusual expressions that she uses such as "hahi" or "hohe" in lieu of a simple "yes"; she also has a tendency to speak her mind without previous thought, especially during special moments, often derided by her friend Aika with a quick "Embarrassing remarks are prohibited!". But despite her seemingly carefree demeanor, she cares deeply for others, valuing her friends above all. She carries a deep devotion to her closest friends Aika and Alice, always supporting them in their times of need and at a loss without them. Our first experience with Akari is a short tour with a young girl Ai, a young closed girl who, with Akari's guidance and companionship, eventually opens her heart to Neo-Venezia. Shortly afterward, the two begin keeping in touch through e-mails, allowing Ai to hear of Akari's unique experiences in Neo-Venezia and vicariously learn of its wonder. Meeting the dawn of a new day with a smile on her face, it�s Mizunashi Akari of Aria Company. Akari is a girl who possesses both unwavering optimism and determination. She gives her all every day to realize her dream of becoming a full-fledged and reliable undine � a gondola operator and tourist guide for the visitors of Aqua � the place born with the terraforming of Mars. With so much enthusiasm and abundant energy, it�s no wonder Akari sometimes happens to make blunders, such as learning to row backwards on the gondola simulators back home. What she never lacks, though, is the will to learn from her mistakes and fix them. Akari holds a inexplicable power over others, bringing a smile to the face of anyone she meets. She is known to express her feelings openly � her seemingly simple-minded comments about life often become a source of inspiration for those who hear them. This is often attributed by her friends to her �ability to enjoy everything�. Indeed, Akari�s bright attitude is a source of strength for her and her friends that allows her to fully take in the beauty filling all of Aqua. Akari is one who genuinely loves the city of Neo-Venezia and considers it to be "made of miracles." Her uncanny ability to make friends with the people of the city is sometimes thought of, by those around her, as a mysterious gift. Even more mysterious is Akari's unusual affinity with the planet of Aqua itself. She occasionally finds herself having encounters that can only be seen as supernatural. Has her gentle, caring demeanor somehow touched the very heart of Aqua? Accepting both the ordinary and the extraordinary with genuine joy, Akari sets out each day, pressing ever forward on her journey to become ARIA's next Prima Undine.